You might remember reading about my issue with our bulky TV and my plan to hide it. I’m happy to say we finally installed our gallery wall around the entertainment area. I might add a few small works here and there, but for the most part this project is wrapped up. 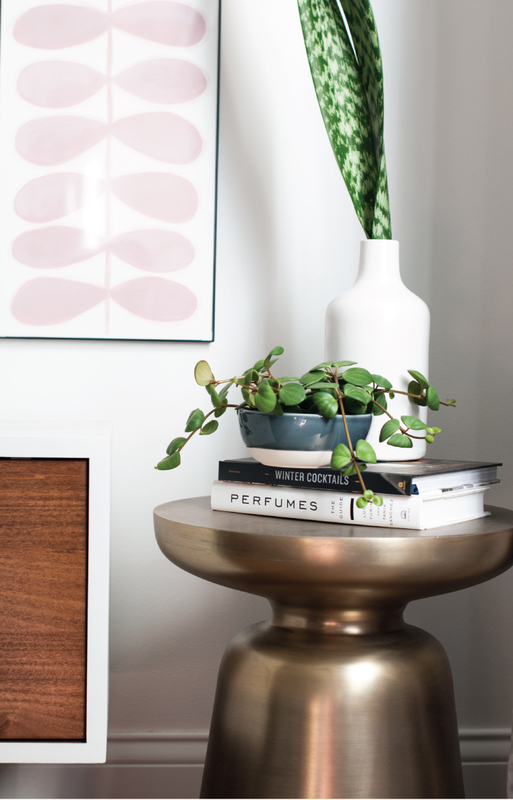 Sourcing art is one of my favorite design tasks and this project was no exception; I was happy to purchase a few things from really talented, local artists. After my gallery wall was finished, thanks to Kalyn’s handy skills, the last step was styling. We still need to find an area rug, but the living room is finally coming together. I’m hoping to feature the entire room, as soon as the last few items find their way into our house. 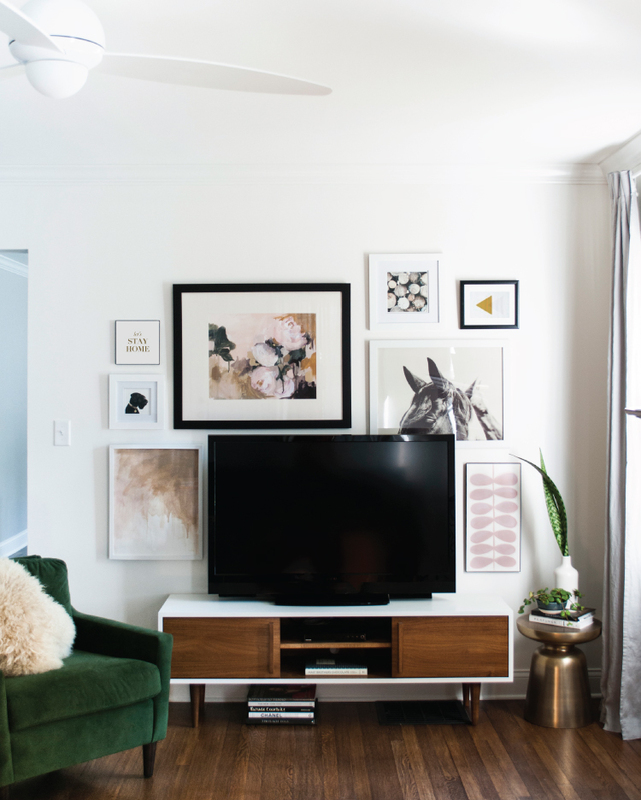 Hi Sarah – Love the gallery wall – hoping to do the same with our living room. Also, do you mind sharing where you purchased your ceiling fan? It’s probably the only ceiling fan I’ve ever seen and liked! Thank you! Hi Claire! Thanks so much. I actually hate the look of ceiling fans, too! However, this was Kalyn’s one request- so I obliged. I liked the white option and it kind of blends in with the ceiling, making it less obtrusive. We also added the light option, which comes with a handy little remote. I would definitely recommend. Thanks, Aileen. You’re very talented yourself! Hi Talysa! Of course- the floors are original to the home. They were in terrible condition when we purchased, so we sanded them down and refinished. The species of wood is red oak, stained with dark walnut made by MinWax. You can buy it at Lowes. Thanks for stopping by! Another ceiling fan admirer here. Can you share the source for it please? I think it’s the first one I’ve seen that doesn’t trigger a gag reflex but in central Arizona fans are an unfortunate necessity. Thanks, Eva! You can find the ceiling fan here. I love the white version, and you also have the option to add a light. It comes with a handy little remote. I also think it would look nice with a ceiling medallion. Thanks for stopping by! I found you via a pinterest image of your bathroom. I will be borrowing quite a bit from that design in my upcoming bathroom over haul. Thanks again for sharing! Hi Sarah! I just love the Peonie print you have here – what size is the print and frame? I think the balance you have is very perfect! HELLO. I just discovered your blog! i am hooked :) what color are the walls in the living room. And I think there are some pictures where a bedroom has a blue wall…what color blue is that?